One of the benefits, indeed one of the fascinations and delights, of working digitally with photography for illustration work is the ability to zoom in, literally at the touch of a button, to reveal otherwise hidden detail. Photography enables the capture of considerable amounts of descriptive data – fine details of hairs, pores and other micro features, that may or may not be diagnostic – in an instant, and which can be readily revealed by enlargement. Of course this is nothing new – it was appreciated back even in the days of the earliest photographs. Indeed a number of botanical artists have used this aspect of photography to help create their highly detailed botanical paintings of close-up views of plants. Botanists too are well aware that photographic detail is much clearer on enlargement and have been enlarging photographs for many years as part of studying their plant subjects. But with the advent of digital technology, this access to otherwise hidden detail is made so easy. I created the image above with a virtual magnifying glass to hint at the hidden depths to these illustrations and also how this sort of image could be used to engage a younger audience for educational purposes. 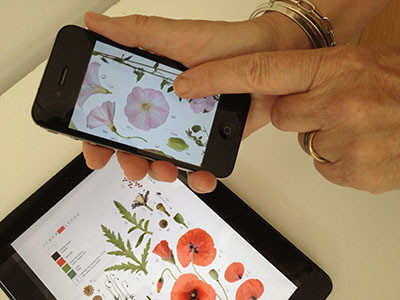 But if you look at one of these images on a smart phone or tablet, it is already possible to see this detail without a virtual magnifying glass – a simple pinch and reverse pinch with your fingers will reduce and enlarge such images, and then you can pan around the illustration to explore the detail. 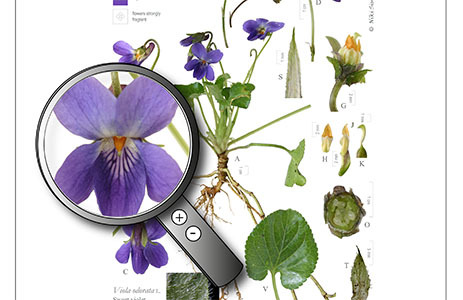 On one level, as a botanist or keen plantsperson, you can observe and study the diagnostic features of interest to you, while at another you can just simply have fun moving around the illustration as the fancy takes you, exploring to see what you can find, what parts look like enlarged and perhaps see parts you have never seen before. On a desktop or laptop, illustrations can readily be enlarged simply using the +/- zoom tools and the viewer can similarly pan around the illustration at any chosen magnification. 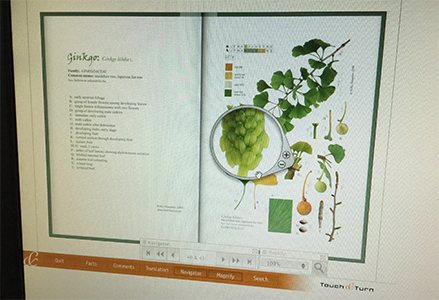 However, with today’s sophisticated zoom tools and with interactive programming, the scaling and magnification of the contents of an illustration need not be limited to this – a viewer can pick up a virtual magnifying glass to view just a portion of an illustration enlarged. Even in 2007, the virtual book I created for my exhibition at the Botanischer Garten und Botanisches Museum, was created using Touch & Turn software that used a magnifying glass which cleverly scaled just the portion under the lens incrementally up or down as the viewer moved it across the page, and all at the same time as the illustration was on a virtual page which could be turned by clicking and dragging a mouse. I am sure botanists already regularly enlarge photos of their plant subjects to study onscreen in the line of their work, but, as yet, do not expect it from within an illustration.